Our 24 hour emergency mobile locksmith services are the guarantee of your security! We are thorough and the technicians of our business are the most experienced specialists in California. We are the best in lock repair and lock replacement and we change any key on-site. 24/7 locksmith services / Auto Key Replacement & Programming! Emergency Services! Same day locksmith services. We offer 24-hour emergency lockout services for all lock and key issues of homes and businesses. There is no doubt about it, when your locksmith issues need resolution, you want a professional and local locksmith who can give you a fast response, anytime. It’s also great if that company is available 24 hours a day. 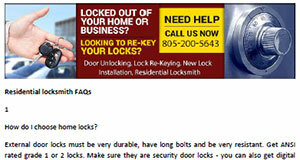 Well guess what, you will find all of these wonderful traits in Locksmith Simi Valley. We are mobile and 24/7 for emergencies. Here when you need us, we do a wide range of services: residential, auto, and commercial, so if any locksmith problems crop up, please don’t hesitate to call. We take care of residential issues as well. These needs are a major reason for our business. We do our best to make people feel safe in their houses. That’s why our technicians are skilled in a variety of services, so whatever your locksmith desire is, feel free to call us. We will handle any office lock-outs. If you left your keys inside of a locked office building or accidentally lost your keys, don't worry, just give us a call and we'll be there to help you in no time at all. Whenever you are in trouble and don't know what to do with broken office keys, broken locks, or lack of a safe, we’re your best option. As we said above we are a fast response company and do not like to keep our customers waiting. When they call, we want them to know they are important to us, so we rush to their aid. We would like you as a customer. 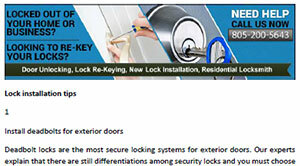 Please come see us or call us.Top grade residential lock repair. We are your one stop shop when it comes to automotive locksmith services, and offer a wide array of services pertaining to car lock and key repair, replacement and new installation. With old cars, you can expect old lock systems. If you want to boost your car security, call us, as we can help you to make that happen. Our experts can handle all things related to automotive locks, upgrading car locks and programming transponder chip keys to work safely and efficiently. Any broken car locks can be replaced and repaired to ensure that they will protect you all the time. You are guaranteed peace of mind on your end, as our team will make sure that you and your valuables are secure. 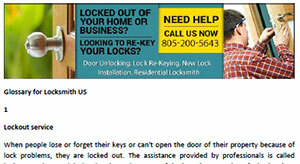 As 24 hour local locksmiths at the zip code 93065 area, we can take care of lock and key problems fast. We offer emergency locksmith services and have the best professionals in California for the installation and repair of locks.